No one offered the deviant breakfast, and luckily he’d had the insight to stay quiet about it. Ken and Jack had both fallen into foul moods, grumbling and snapping over every little annoyance. Everyone should have taken that as a cue to tread carefully, but it wasn’t enough to keep the beady-eyed Info-Corp and the white-clad nurse from getting into it again over the spiritual implications of society’s fall. The rest of the group watched anxiously while the two went back and forth. “I’m not going to argue with you,” the nurse said numerous times, only to be pulled back into the debate by another snide remark. “Who’s the idiot?” the nurse scoffed. “Whatever,” the nurse said with a show of indifference. Ken cut her off mid-sentence with gunfire to the ceiling. The deafening blast echoed through the cavernous space while bits of plaster and dust sprinkled down from the scarred dome, causing everyone to stop what he or she was doing and turn to see what the enraged police associate would do next. At first, no one was willing to step forward, choosing instead to look among one another to see if anyone else would volunteer. Safety in numbers. George weighed the risk of grouping off with a loose cannon against showing weakness against a man who’d clearly let his limited power go to his head. Someone there needed to offer a show of strength, even if the move was a dangerous one. With his company as a buffer, and with looks of relief washing over their weary faces, both the Mart school associates joined him. “Grab a light if you want to see where you’re going beyond the tunnel,” he said specifically to George. “The northern shuttle garage is a big one, and I’m not going to hold your hand through the dark while you pick a corner to piss in.” With a newfound huff of annoyance, Ken started for the south pedestrian tunnel. George and the two others followed. The sound of rain became prominent once they entered the tunnel. A drop of water leaking through the cracked ceiling landed on George’s forehead, serving as a sobering reminder of a future without social order. No structure meant limited sustainability, which in turn meant even their claim on the Food-Mart ensured only a finite supply of food and water. Even more, without the deviants’ cheap labor and their constant work on the ever-crumbling infrastructure, the fierce weather would destroy the integrity of their underground world sooner rather than later. If they wanted to survive, they would need to find a new approach to their way of living. They would need to start from scratch. With so few of them, the prospect was daunting. Who among them had carpentry skills? George sure as hell didn’t. Did any of them know even the basics of farming, canning, or animal husbandry? Would their self-appointed leaders guide them to their demise before they even had a chance to gain a new foothold, or would the Food-Mart collapse in on them, a refuge turned tomb of cement and dust, before they could regroup? Aftermath is available in Kindle and trade paperback. Between now and December 20, go to Goodreads to enter for a chance to win a copy of my recent release, Aftermath: Beyond World-Mart. Giveaway ends December 20, 2015. Aftermath picks up right where World-Mart left off, beginning with the end of civilization. 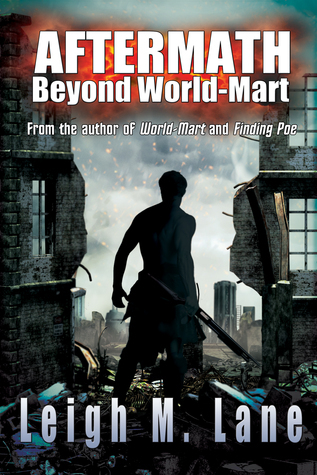 Readers who enjoyed World-Mart, Vonnegut's Cat's Cradle, Orwell's 1984, and Bradbury's Fahrenheit 451 will enjoy this last installment of the World-Mart trilogy. Thanks for entering--and good luck! For that, I used a social experiment that took place in 1968, beginning the day after Martin Luther King Jr.’s murder, as my inspiration. Grade school teacher Jane Elliott, an advocate for human rights on many fronts, decided to show her eight-year-old students, all white, the effects racism truly had on society—not only on the people being discriminated against, but also those imposing the discrimination. She segregated her classroom by “blue eyes” and “brown eyes,” first convincing the children that blue-eyed people were intellectually superior, and thus offering them privileges the brown-eyed children were denied, such as longer recesses, more food at lunch, and being seated at the front of the classroom. Resistant at first, the children soon changed their attitudes toward one another. The blue-eyed children began to treat their brown-eyed peers poorly, teasing them and putting them down, and the brown-eyed children showed an immediate drop in self-esteem. The next day, Elliott told the children she’d lied the day before—that brown-eyed people were in fact superior—switching their roles. Interestingly, the brown-eyed children suddenly behaved exactly as the blue-eyed children had before the tables had been turned. It seemed that it took little provocation to create a racist society. For those curious to see the experiment in action, PBS has the full 46-minute Frontline exposé available here. Watch the first ten minutes in the video below. Those familiar with the experiment probably recognized the significance of the blue-eyed “deviants” in World-Mart. No different than anyone else, save a negligibly higher immunity to antibiotic-resistant superbugs and their tell-tale icy-blue eyes, the deviants are the future’s slave laborers. They are believed to be intellectually inferior to “normal” human beings, and they are treated as such. When I set out to write The Private Sector, which prequels World-Mart by about forty years, I was excited to explore the deviants’ origin as “designer children” available only to the wealthy. People marvel at how beautiful their eyes are—the pale blue color being an unexpected side effect of the particular genes manipulated in an attempt to create a future immune to the diseases killing people off in droves. When they fail to prove society’s answer to the plagues, some begin to demonize them as abominations, the sickening result of man trying to play god. What underlies this shift is my own personal observation that humankind is predisposed to an “us” versus “them” mentality. Even with actual race taken out of the picture, we find a way to create meaning out of petty differences, a reason to treat others differently. A reason to feel superior, be it physically, intellectually, or morally—and we use it to justify mistreatment, neglect, and downright hatred. We see these behaviors resulting not only from differences in skin color or other genetic traits, but in egocentric nationalism, anti-feminist attitudes, and discrimination against homosexuals and the transgendered. In no time during documented history have we not seen evidence of a socially imposed underclass. The first natural response to this might be to question why. My question, and the question I raise in my World-Mart series: Why do we continue to allow these types of attitudes to rule the masses? More importantly, what can we, as socially responsible human beings, do to eradicate the “us” versus “them” mentality once and for all?